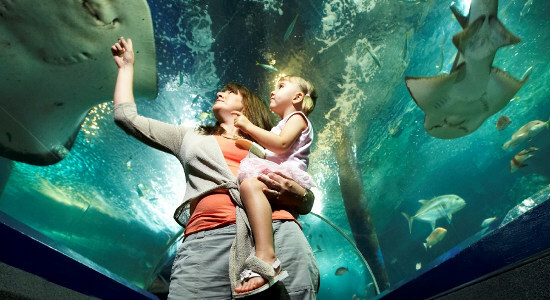 UnderWater World SEA LIFE Mooloolaba is an award-winning attraction and QLD's largest oceanarium and aquarium. You will come face to face with sharks, rays and other amazing creatures as you surround yourself in the beauty of thousands of coral fish in our 2.5 million litre oceanarium. Be enchanted by seals as they show off on our famous seal show. A moving walkway will take you around the 80m course past several viewing windows, with fish and other creatures of various types viewable up close swimming around the walkway, including sharks, rays, eels, whalers, and dozens of other species. Also on offer is the "Crawly Creatures" exhibit, which takes you on an interactive journey from land to deep sea, and features the world's largest marine, land and migratory crab species. Be astounded by the size of some of these creatures, including giant Japanese spider crabs, robber (or "coconut" crabs, and red and blue Christmas Island crabs. Be sure to check out the always-entertaining otter and seal shows where you can witness the amusement of the personalities of these playful mammals. 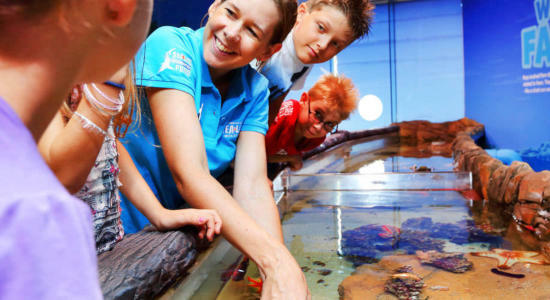 With such a wide range of features on offer, at UnderWater World SEA LIFE Mooloolaba, you will be enticed by over 5,500 weird and wonderful sea creatures and enjoy over 14 tours, talks and feeds daily. You can even take a swim with seals, receive a seal kiss or take part in the world first Otter Adventure! Book now to go UnderWater! A gift voucher for entry to SEA LIFE Sunshine Coast - Queensland's largest aquarium - will let you come face to face with rays & more! Gift this SEA LIFE Sunshine Coast package with general admission plus a choice of a plush toy, digital photo pack or behind the scenes tour!